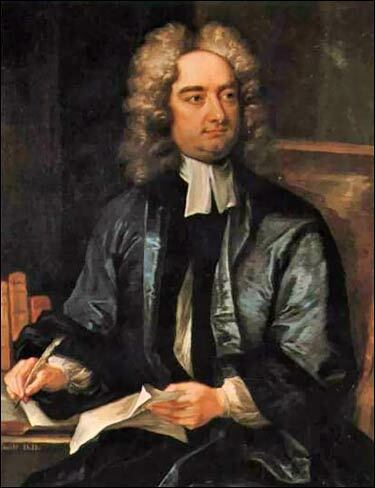 In this collection, you can find a wealth of material by or relating to Jonathan Swift (30 November 1667 – 19 October 1745). Listen to the talks by Dr Abigail Williams, read the ebooks and essays to learn more about Swift and his work. Jonathan Swift and 'A Tale of a Tub' and Jonathan Swift and 'Gulliver's Travels', distilled from a lecture series on Jonathan Swift given by Dr. Abigail Williams of the University of Oxford and adapted for the Great Writers Inspire project by Kate O'Connor. You may also want to explore the essays about The World of Writing in the 18th Century and High and Low Culture and the resources associated with them. The Lady’s Dressing Room by Jonathan Swift. 4 Miscellanies. By J. Swift. To which is prefix'd, A complete key to the Tale of a tub. Originally published as: A meditation upon a broom-stick, and somewhat beside. 6 A serious and useful scheme, to make an hospital for incurables, of universal benefit to all His Majesty's subjects. .. Dated on final page "Dublin, December the 4th. 1708.". With preface, introduction and notes by George A. Aitken.